Agnes Atwood has never gone on a date, never even stayed out past ten, and never broken any of her parents' overbearing rules. Rules that are meant to protect their legally blind daughter—protect her from what, Agnes isn't quite sure. So when Bo shows up in the middle of the night, with police sirens wailing in the distance, desperate to get out of town, Agnes doesn't hesitate to take off with her. But running away and not getting caught will require stealing a car, tracking down Bo's dad, staying ahead of the authorities, and-worst of all-confronting some ugly secrets. 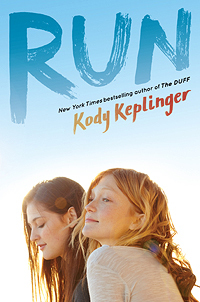 "[...]a timely, edgy plot, distinct character voices, and a solid depiction of friendship."